Addis Ababa Baladera Council organizer, Eskinder Nega, did not say much about the circumstances that led to the repressive measure on the part of government to ensure that the council’s event will not take place. Abiy Ahmed’s government sees “rule of law issues” in the movement. 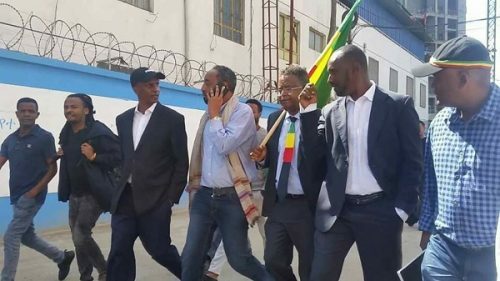 Ethiopian government is resorting to forceful measures in connection with the issue of Addis Ababa. Police on Saturday dispersed press conference which was planned to take place at Ras Hotel. 3 Responses to "Police dispersed Addis Ababa Baladera Council’s press conference at Ras Hotel"
Addis Ababa belongs to all Ethiopians! How do you even own a city? You might have history with the land but it’s in the past. Honestly it was the Amhara royals who built the city to such an extent. I don’t know any city that was formed from scratch by the Oromo and developed into an international scale. This is a mockery of justice! That is why some of the seasoned politicians asked the PM to walk the talk. Now we are watching injustice in action. Has God forsaken this backward country to backward ethnic politicians? May the creator save this country from this ‘Satan’-ethnic politics.